A Broward Sheriff's Office deputy was part of the massive contingent of law officers deployed to Marjory Stoneman Douglas High School in Parkland on Feb. 14 during the shooting. Code Reds, hard corners, and arming teachers are some of the recommendations made by the state commission investigating the shooting at Marjory Stoneman Douglas High School. Listen to the Jan. 4, 2019 episode of the South Florida Roundup here. The commission submitted its report to the state Legislature a day after the New Year. 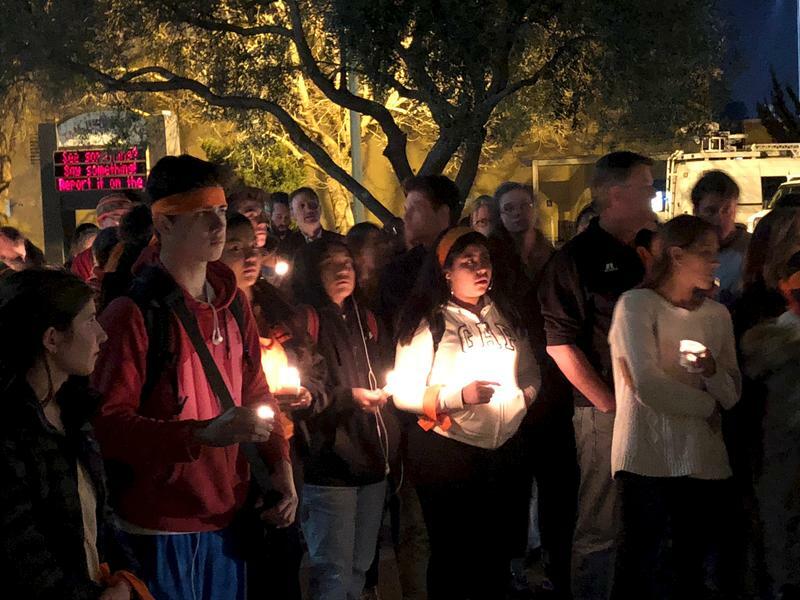 It’s more than 400 pages long and goes into detail about what led to Feb. 14th, 2018 – and what could be done to prevent a school shooting in the future. In the months after the shooting, Florida schools have worked to meet a new school safety law. It puts limits on gun access and mandates a school resource officer in every public school. Host Christine DiMattei fills in for Tom Hudson on the South Florida Roundup. She’s joined by WLRN reporters Jessica Bakeman and Caitie Switalski and Anna Fusco, president of the Broward Teachers Union. Tracy Jackson, director of Broward County emergency services, also explained how the 911 response system works. WLRN: School should be a place of learning. A place of fellowship, a place of sports. And now look at what's happened. What are teachers and principals doing with the kids to ease their transition into adulthood? ANNA FUSCO: Reminiscing back on my time in the classroom, we're everything for our students. We spent 180 days with them, sometimes plus on weekends. And we are their go-to people outside of their caregivers. The social-emotional component is so very important. What would be a great thing to look at is that we know that education is important with the standards and the academics and you know getting that lesson in. But if you don't have them in tune and they're not engaged and they're not able to function we're not going to get through to them. I'm glad to hear that the commission is going to spend a lengthy time and looking into the mental health component. We need more mental health counselors. We need a lot more people that are really experts at it to help us teachers, training us to get some you know tactics and techniques to see what these kids need and get them referred to the professionals to help out. We'll have a better quality student and we'll be able to have better quality education. JESSICA BAKEMAN: The report from the commission said that they were going to take some more time and come back with another report in January 2020 with more comments or recommendations regarding mental health issues. And one of the things that Caitie and I noticed as we were reporting on the commission over the last eight months was there are 16 members and they're all coming from different perspectives. WLRN: Caitie, what have parents, teachers, students told you about the need for more mental health services in schools? CAITIE SWITALSKI: We're at the point where it's almost one year after this has happened. I will tell you the need for mental services and therapy and attention in Parkland has not diminished in the slightest. I think it's really important for parents and students to feel heard. I know Marjory Stoneman Douglas has brought on a lot of mental health assistance, but Broward schools as a district has not beefed that up yet. I think it's important when we look at this report from the commission when they address mental health here it is so brief. They are reminding us what SB 7026 did for mental health. And that was the legislative session after the Parkland shooting that created this commission. That was the bill that did dedicate money to some mental health resources and hiring people to come into schools. But it's interesting that eight months after that bill, we have our first report and it's reminding us what the bill did. A day after a statewide commission released a scathing report on the handling of the Parkland shooting that left 17 students and high school faculty members dead, a Broward Sheriff’s deputy who did not confront the gunman was placed on restricted duty. Deputy Joshua Stambaugh was informed of the decision by BSO at 9 a.m. Thursday, Jeff Bell, the union president confirmed. 2018 was a busy year in the news, even by South Florida standards. The deadliest high school shooting in modern U.S. The year that was, 2018, was an action-packed - and error-filled - year of news, according to the people working over at PolitiFact. There was a lot of competition for their annual Lie of the Year honon. President Trump was at the top of many reader's lists: Comments about the migrant caravan from Central America. Claims and counterclaims about Russian interference in American elections. But there was a bigger story that particularly affected Floridians.